Sorry for the lack of post, didn't have time and wasn't in the mood... I let you know why later. But enjoy these lovely flowers (if someone knows their name in English...). Have a nice day! Quelques renoncules pour compenser mon manque de présence, mais je n'ai eu ni le temps, ni l'envie... Je vous dirai pourquoi un peu plus tard. Très belle journée! Fair enough! lovely flowers and Happy Easter! it pays handsomely after lotsa of hard work! 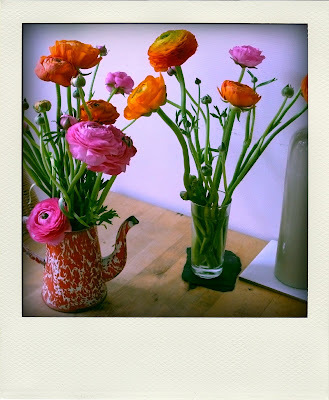 The English word is much like the French-- Ranunculus. Love them in the teapot.